Who's Measuring the Percentage of Weight Gain During the Holidays? The New England Journal of Medicine that's who! The story goes that most people gain an average 5lbs during the holiday season. However, the New England Journal of Medicine conducted a study of approximately 200 people which proves that the 5lb weigh gain is not as true as previously thought. There are graphs and variations taking into account the age of the person, the current weight, conditions and the understanding that as one gets older there is a continued weight increase which is not that more significant during the holiday season. The conclusions will astound you! Please see the New England Journal of Medicine's detailed graphs and charts to see where you are! Make sure to click on the full article to get a complete understanding of the study. I tend to like the word 'Piggery'-however, it is what got me into trouble on the first place. I have a lot to be thankful for -- one of the things was the allergy medicine I just learned I have to take. It makes me sleepy but guess what? The vet said I need an extra 1/4 cup of food a day when taking the medicine - I now have a new found appreciation for my vet -- which I am thankful for as well! I am thankful for my sister Daisy... my brother Weezy, mom & dad and of course food - in all it's glory and insistence that I eat it! The picture there is of Daisy wearing her bandana. Getting back to the vet - she says that if it is not the air outside/ragweed/mold it just might be certain foods. We are still in the discovery stage so it may take a while. 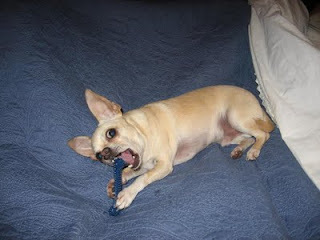 In the meantime, she said I need to lose a pound -- and for a Chihuahua like me - 1lb is like 20 on a human! So what if I stole a bite of pizza or that slimy rigatoni? I steal carrots and broccoli too you know! Now I am paying for it by having itchy paws and eyes. ...just 20 more days of medicine left - I wonder if they will take my extra daily plate of food once I am through? The turkey was so good! I can't help it - I'm a lover of food! I ate all five, a silly canine - and now I sleep like a log! When oh when did my hoodie become one? And when my hoodie I extend, it's then I hide from my mom's friends. I love my hoodie -- yes I do, it gets me foodie, don't it you? ...that another doggie just like me, will enjoy it more and warm he be. On a recent shopping trip, a stranger stuck her hand in my carrier and started to try and touch my ear while asking - "Do you bite?" A co-worker approached telling her - "You don't go and stick your hand in a dog's face and THEN ask if it bites-- that's a good way to find out." Luckily for her - I wasn't hungry that day - woof! woof! woof! I was thinking about this - and trust. One can tell those who are 'dog people' and those that are not. Dog people will approach most dogs trustingly in hopes that their dog-loving aura will be detected by said dog and dog says "This one is a friend - not foe - proceed." But then even I have been accosted by seemingly innocent canine companions. Thinking - they are my friend and whoops - their Elvis-like snarl takes over! I have never bitten anyone - regardless of my mood. I think most people carry food with them - in their pockets - in their purses - sometimes right on their hands -- and why ruin my chances? Next time someone asks, "do you bite?" I will reply - "Yes, I bite, I bite food - do you have any?" For some reason each time I have a rawhide bone I don't get to keep it for long. Mom puts it away after watching me play and chew for a while. Yesterday, dad found where mom was keeping it and let me have it. It wasn't long before Weasel and Daisy stole it from me. They had already eaten theirs - why take mine? So mom gets home and says something to dad about how it is my bone. She takes it from Weasel, who now has eaten it to the last nub and gives it back to me. Daisy then comes by when mom walks away, steals it and hides it and mom finds it in the foyer bench cushions and gives it back to me. Minutes later, mom tells me she wants me to go out - and of course, my bone is gone. Oh where, oh where has my little bone nub gone? Oh where can it be? I had a hard time waking up this morning. Mom says I looked like Mr. Magoo with eyes half shut while she was trying to put on my sweater. I think the steak I had last night did me in. Mom and dad had filet and there was a lot left over so they shared it with me, Daisy and Weasel. We didn't get much though - so it wasn't fair! Anyway - guess what I did this morning? I think I perfected the 'roll-over on my back' trick - or what they call Bang Bang... They point their finger at me - say "bang bang" and I roll over to play dead... here's the thing - I knew I would get some sort of treat if I did it - so I did. Not so sure if I will do this on a regular hard wood floor - you'd have to bribe me. So finally we were able to fix the whole photo issue. It appears all we needed to do was minimize it to 85% proportions and that made a difference. I thought about today - we went to a get together and I was brought to practice being with other people. About four different people held me and kept saying how good I was. I am not sure what I was supposed to be good about - since they were holding me. There really wasn't anywhere to go. The only scary part was that two of the people who held me where continuously trying to kiss me - hard to get used to that. One might have even put lipstick on me. The woman said that I had a kissable little face. The man kept saying that I was gentle and soft - and another little boy mentioned how sweet I was. What did he expect me to do -? Bite him? I was admiring the taco dip mom made that was on the table. She let me have a taste but that was it. I was starving! I should have taken a bigger bite. Next time - beware - WOOF! We had a Howl o' ween party on Saturday afternoon - and everyone was excited! I was even more excited because it was my very first one! Last year we did not have one and people complained because they wanted us to dress up. 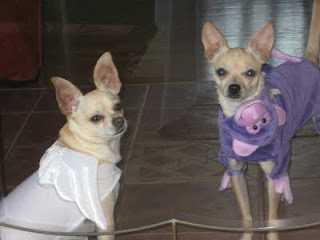 I was an Angel last year and my sister Daisy was a purple monkey. 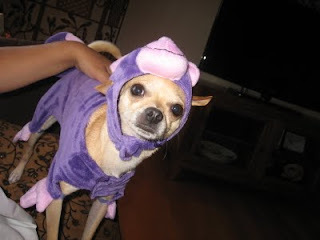 It's funny now because initially, I was going to be a monkey and mom could not decide between that and and angel. Then we adopted Daisy and it worked out - it was almost like it was made just for her. She looked really good in it. The weather was nice too - it was about 70 degrees. Mom had never dressed up for Halloween and she took an old sheet and made holes (but they were uneven) so she could see. She stood outside passing out candy and scaring the neighbors - it was really funny! Daisy and I just watched everyone from the front door. This year though, mom planned an elaborate party. Initially she wanted me to be a banana (hence my name) but then Target was out of the banana outfits and although she searched and searched - all they had were xsmall and mediums... and I needed a small. No matter, at the very last hour mom went to pick up Daisy's birthday cake - and there, she saw a bumblebee outfit - guess what I was for Halloween? HA HA. Daisy though, was a pumpkin. She looked really cute. We had birthday cake, a Halloween costume contest, a red carpet and stage and pizza. The professional photographers took photos of everyone. They donated all the time and all the money collected went to TLC animal shelter. I did not win the contest - Lola did - she was a bug (centipede). But still, it was fun to be there with all my friends. And then we sang happy birthday for Daisy - and we all got some cake. Afterwards I was pooped! Daisy and I slept on the way home - it was a good day.